I’m 42 and a mom of 5-year-old twin boys and still don’t know how to dress myself. I love my life and being a mom but I never thought I’d be one and I don’t know how to dress like a mom. My partner’s in a band, music is our religion and our life blood I still go to shows when I can and most of my friends don’t have kids and dress how they always did. I don’t like being fancy I don’t wear heels and I don’t like wearing color but I need to look like a responsible adult when I go to things at my sons school and games as well as things like weddings and graduations. Is there hope for me? Just because you have kids doesn’t mean you have to give up your passions, your style, or dress in a certain manner. However, if you want the focus to be on your boys instead of you, it’s a good idea to have some pieces that fit your personal style but also fit the event or situation. 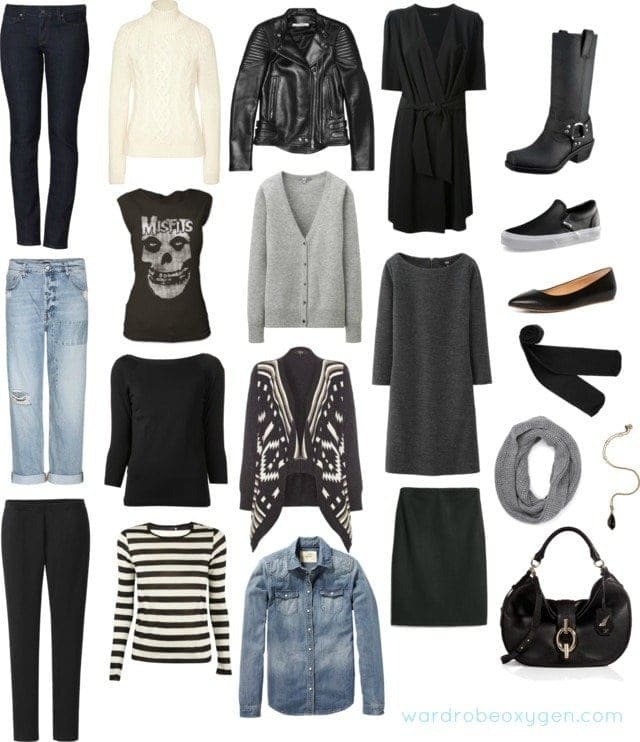 This casual winter capsule wardrobe is for the moms about to rock, we salute you! Current fashion embraces your passion, and it will be easier this year to find wardrobe staples that fit your personal aesthetic. Sticking to a black, ivory, and gray palette with touches of denim and classic shapes, this collection allows you to personalize with your favorite band tees and accessories. Two pairs of jeans, one dark with stretch, and one with a bit more personality – I chose a distressed boyfriend but you could switch this out for black or coated denim or a different cut. The dark is slim enough to tuck into a pair of tall boots or wear as-is with sneakers or flats. A pair of pants in ponte knit are as comfy as yoga pants and can be paired with boots or sneakers, but can also dress up for a parent conference with a simple sweater and flats. As for tops, condition is the keyword for your look. If you’re going to wear distressed jeans, well-worn leather jackets, and decades-old band tees it’s important that other parts of your outfit are in crisp condition to show the weathering is purposeful. A cableknit sweater in bright cream or ivory is a classic piece and would beautifully highlight leather and denim, and would dress up nicely with simple black pants or skirt while adding warmth. Merino wool is a tight weave with a refined finish and can be found at reasonable pricepoints (check stores like Marshall’s where I’ve found merino sweaters for $19.99); a black sweater in this knit with an interesting neckline (in this capsule I chose boatneck but you could do V, surplice, scoop) will dress up nicely while still being comfortable and easy. I’m a fan of stripes because they add interest without being too trendy or ostentatious, a black and white or ivory stripe will look great peeking out of a denim or leather jacket or cardigan sweater ; I love rolling up the sleeves of a jacket to have striped long sleeves peeking out. It’s winter and you’ll need layers and knits to stay warm, especially when in the bleachers at your sons’ games. Don’t shove your biker jacket to the back of the closet just because you’re a mom, that piece can be the cornerstone of your entire wardrobe. Throw it over tees and jeans, but also pair with a cream cableknit, ponte skirt, tights, and flats or even pair with a ponte knit dress. The more beat up, weathered, worn, and perfectly fitted to you, the better! A longer v-neck cardigan (often known as a grandpa or boyfriend cardigan) is an easy layering piece; leave open over a band tee with jeans and boots, or button it and top with a skinny belt to dress up trousers or a skirt. A waterfall cardigan in a graphic print instantly adds pizzazz to your look without much effort and can take your basic tanks and tees and make them look polished. A denim shirt with a good fit (fits in the shoulders, nips in a bit in the waist, not too oversized but can cover at least half the bum) is a wardrobe workhorse; wear open like a cardigan for casual days, or button up and tuck into a skirt or jeans to add a touch of polish. Dresses are easy one-step dressing, and they don’t have to equal “fancy.” A wrap dress or a style with some drape not only flatters the figure but it also has so much interest that accessories aren’t necessary. Choose one in a versatile fabric (matte jersey, crepe, silk) that can dress up or down and work for more than one season. A dress like this can be dressed down with a pair of sneakers or glammed up with jewelry and polished leather flats. A sweater or ponte shift with sleeves can be one of the most worn pieces in a woman’s wardrobe. In fall, pair with leggings and flats for Back to School Night. Come winter, wear with tights or leggings and tall boots for the school play. In the spring, pair with Chucks or Vans for a field trip or flats and a pendant necklace for a neighbor’s day wedding. While black may be the color you gravitate, this is a piece where a switch in color (gray, navy, a dark color you’re comfortable with) may be a better choice because it will look better after multiple washings and not be so solemn for more festive occasions. A simple ponte skirt in a comfortable shape (this is a straight, not pencil skirt featured but a drop-waist, flared, pleated, or a-line style would also work) can be paired with tights and boots or flats to quickly dress up even a band tee shirt and boots and gives the jeans a break for one day. You don’t need heels to look dressed up; I chose three completely different styles of flat shoes that will fit your personal style and are nice and low to the ground. A pair of tall boots is extremely versatile and keep you warm in winter. The style is up to you; I chose an engineer boot for this capsule though a riding boot or a low wedge would also work nicely. Chucks and Vans are classics; I added some warmth and polish by choosing a leather version of the original Vans slip-on. If you choose to do a canvas shoe, be sure it’s not too dirty or worn; again the keyword is condition. Finally, a pair of structured black leather flats (not ballet flats, something with stability and a proper sole) if well maintained can replace heeled shoes in most situations. I know you don’t like a lot of frills, but accessories can really complete a look, especially if it’s made of very simple pieces. A scarf is a great way to stay warm and also add interest. If you wish to stick with the black and gray palette, choosing an interesting texture is the way to go. If you do have a color or print you’re fond of, this is a way to incorporate it without it being overwhelming. A long pendant necklace will work with the simple garments and add interest and a bit of shine. While a pendant on a cord will accomplish the effect, choosing one on a chain will add a bit of shine that can quickly dress up an outfit. Finally, a bag is a great way to add personal style to your everyday look. Right now lots of hardware (shiny silver buckles, zippers, and chains) and fringe are in style so you can likely find a bag that will hold all your mom essentials and embrace your rocker at heart style. I totally, totally love this! I wish I was badass enough to pull off this kind of wardrobe! I see myself as fairly edgy in my personal life, but I could never dress like this at work 🙁 I totally love the aesthetic, though!!!! So happy to have found this! I have been struggling with dressing myself lately, as awful as that sounds. This is me to a T, love love love. Love this! But then this is pretty familiar sartorial territory for you too, isn’t it Allie! I’ve always loved your rocker chick outfit posts! That being said, I also dig your new minimalist direction! Actually, you can do no wrong in my eyes! I love this look thankyou! As a new mum I’m still in the yoga pants and tshirt stage but need ideas for looking like a responsible adult without being mumsy. I think this hits the spot! As much as I love all of your capsule posts, this is my favorite. Ive been trying to reconcile my rocker mindset with the need to look like a put together adult and struggling, and this is a huge help. So glad I could help, thanks Kat! My favorite capsule wardrobe to date. Brava! I love this capsule!! I don’t have ANY kids but I am approaching 53 yrs old and I am not the frilly, preppy kind of dresser / style. This style suits me also !! Thanks !! Great suggestions! This is really far from my style, but I think it looks great! You NAILED my style – thank you! At 50 I struggle with this but it’s what I’m most comfy in. You rock! I’m getting closer and closer to the rocker look in my every day and I’ve been using pieces like these to make it easier to transition from my semi-corporate job to weekends. I think this is spot on and hope it helps the mom with the twins!